Here we are between Thanksgiving and Christmas, running as fast as we can towards the BIG day! It’s hard to resist fast food when we are so busy winding up end of year reports at work, trying to get shopping started, if not done, and decorating the house- inside and out! Leftover turkey dinner made it easy to come up with dinner for a few nights after that, but now it’s gone and even the turkey soup has been consumed! For a nice change of pace, I have an easy recipe that is loved and often requested by our grandkids (and kids) called “hot dog stew”. 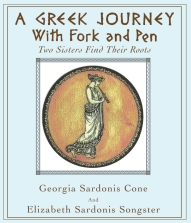 In our book, A Greek Journey with Fork and Pen, the recipe is called “Mom’s Chicken, Potatoes and Peas” (page 27) because she substituted chicken for the hot dogs that her mother used to use in this stew. I know…hot dogs don’t sound very Greek but when they were growing up, all their friends talked about having hot dogs, which they never had because my grandfather believed (and was right) they were made with scraps from the meat plant and were not very healthy. To appease the children and my grandfather, Yiayia came up with this stew, saying that cooking these hot dogs like this would make them “better”. My Mom substituted the chicken for the adult palette, but always threw in the hot dogs at the end if kids were eating it, too. Don’t get me wrong, you can leave out the hot dogs and the kids will love the chicken, but there is something about those hot dogs mixed in with the savory stew that cause the kids to really clean their plates and even ask for more! In a large skillet, season chicken well with salt and pepper and brown in the melted butter; remove to deep saucepan. Saute onions in pan drippings, add garlic and saute until soft. Pour over the chicken. Add wine, cover and simmer for ten minutes. Add tomatoes, tomato sauce, broth and potatoes. 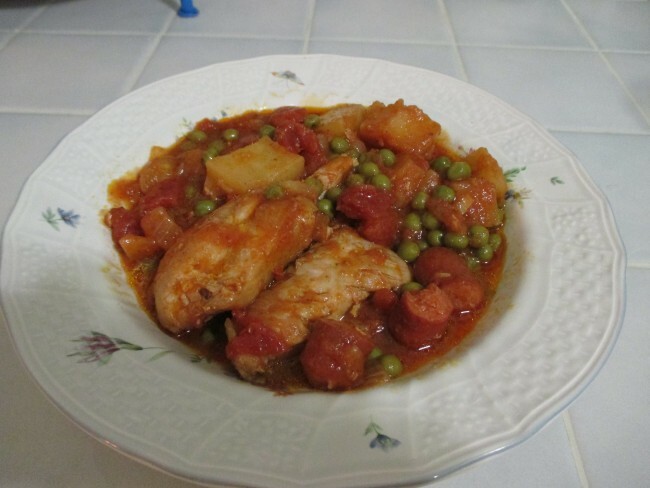 Cook slowly for about an hour until chicken and potatoes are cooked and sauce has thickened. About ten minutes before hour is up, add frozen peas and continue to cook until peas are done. Serve with feta cheese on the side if desired. If you want this to be very kid-friendly, cut up a package of all beef hotdogs into about one inch chunks and mix into the stew about a half hour before the stew is done. I know I said this is for the kids, but cooking the hot dogs in this savory stew gives them a wonderful flavor that even the adults love, along with their chicken. This is one of those dishes that tastes even better the next day, so you can certainly make it a day ahead. If you make a really big pot of this, you can have it more than one night! By the way, you can probably make this in your slow cooker, too! I’ll be back before Christmas with a “sweet” recipe. Meanwhile, don’t forget to take a break now and then! See you next time. I so appreciate having this special cookbook. Recently I made the Mousaka, my mother’s recipe. I really brought me back to being in her kitchen…all the fabulous smells! It came out great, and was a hit with my family. Thank you Elizabeth and Georgia, for keeping these memories alive! My mom loved the treat, Hot Dog Stew! I will make some soon, hot dogs and all!